Your pool defines your own personal style. A beautifully designed swimming pool can add a unique flare to your backyard. The first thing you need to do before choosing the perfect pool, is to choose the right decking. There are endless ways to design and style your pool to make it look more attractive. One of the ways is, to choose the right deck material. In order to choose the right decking, you need to take safety, comfort, and style into consideration. Are you wanting to build a pool in your backyard? Are you having trouble finding the right deck for you? If yes, then we have got your back. Our experts are here to help you design and chose the best decking option possible. The most basic deck for your pool can be the basic pattern concrete deck. It is cheaper than other pool decking options. It can be plain, but to improve its appearance, you can add textured patterns, tinted finishes or pre-fabricated concrete pavers. Travertine paver decking would be for those who like to stick on the natural side of things. An advantage of travertine decking would be that it doesn’t heat up in summers as much as other pool decking material options. This is because travertine pavers are made of wood and has more heat resistant properties. Deck coating is the classic decking option for pools. Deck coating can also add more value to your pool, and property. The deck coating installation process is a bit more time-consuming process and is considered a more expensive pool decking option. Porcelain pavers are the most common pool deck option of all time. They give a sleek look to your pools. They are also affordable and come in many colors and designs to choose from. However, they may need ground maintenance every once in a long while. 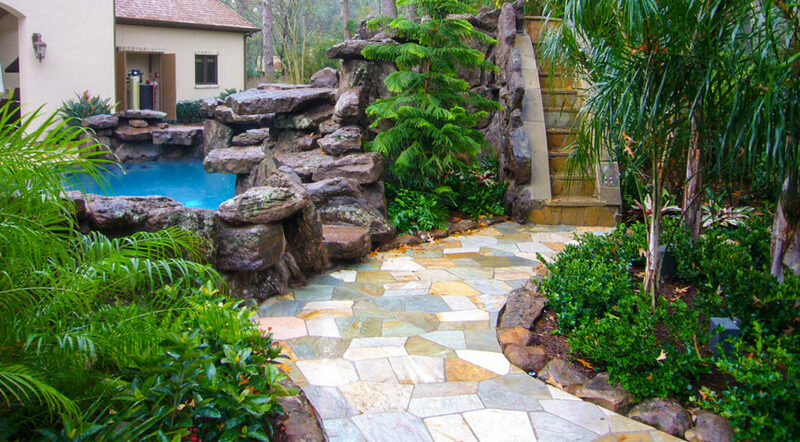 Stone is the most loved type of pool decks. They are usually made from flagstones because they have plenty of flexibility. This gives a special touch to the look of your pool, without the concern for uniformity. The above-mentioned points are the types of pool decking. Pool decking can change the whole look of your pool, and choosing the right pool deck for you is very essential. To make your pool even more attractive, you can add water features to your pool. If you need guidance and more information just look more into our website, or ask anything regarding your pool in the comment section below. We would love to answer and guide you in getting the pool of your dreams!